Why is the EquiPedic™ pad better than other saddle pads? There are six reasons why. The patent pending EquiCHARGE™ Oxygen Energy Recovery System increases your horse's blood flow and oxygen transfer to the back area under the saddle. This can result in increased metabolism, increased energy, and faster muscle recovery. This will allow your horse to perform better. Wouldn’t you perform better if you had more oxygen and more energy? No other pad can offer this feature! The patent pending EquiKOOL™ Temperature Management System keeps your horse cooler and more comfortable over extended periods of time, automatically recharging. This will allow your horse to perform better. Wouldn’t you perform better when exercising if you were cooler? No other pad can offer this feature! The ConforPedic Impact Reduction Material™ protects your horse like no other material. It conforms to your horse’s body and the bars of your saddle. It fills in gaps caused by ill fitting saddles and variations in body style, even swaybacks! It completely eliminates pressure points caused by these conditions. It is orthopedic in nature and eliminates sore backs on horses. In addition to being anti-fungal and anti-bacterial by nature, it is completely machine washable! Unlike other pads, every component of the EquiPedic™ pad is 100% breathable. There is nothing in our pad that will hinder or stop moisture transport and evaporation to the atmosphere. Your horse will stay cooler and drier at all times. It is truly an anti-slip pad. EquiGrip Strips™ , made from ToughTek®, lock your pad into place from the pressure of the saddle bars from your saddle. It will not slip from front to back or up and down. Its relationship to your saddle will remain constant regardless of terrain variations. Does the EquiPedic™ pad breathe? Absolutely! More than any other pad on the market. The pad uses a multi-layered construction consisting of all breathable materials. The layer closest to your horse is wool felt. This material is 100% breathable and wicks moisture away from your horse’s back better than any other material. Our EquiKOOL™ Temperature Management System and the EquiCHARGE™ Oxygen Energy Recovery System are embedded in the wool felt. It is embodied in a non woven material that allows for further moisture transport from your horse’s back as well as managing your horse’s surface body temperature. The ConforPedic Impact Reduction Material™ is made from open cell material allowing for even more evaporation. The next layer is an additional layer of felt. This layer allows for more moisture transport and evaporation. The outer layer of the EquiPedic™ pad is made from either uncoated 1000 denier Cordura™, or uncoated jacquard nylon allowing for moisture evaporation. Other pads use polyurethane coated Cordura™ that is not breathable and blocks evaporation. These other pads actually trap moisture inside their pads! What's wrong with gel pads and air pads? Both gel pads and airs pads attempt to address the shock absorption problem in the same way. They enclose an absorption medium in an enclosed bladder that can't breathe. The bladders are placed right under the bars of the saddle where air flow is most important. As a result, the horse gets extremely hot and sweats more! The other problem with these pads is that the absorption medium is limited by the confines of the bladder. As more pressure is applied from your saddle or your weight, these mediums will compress until they become hard as a rock or they will squeeze out from under the saddle. At this point, they will actually hurt your horse! The ConforPedic Impact Reduction Material™ used in our pads will spread beyond its original envelope as more pressure is applied and will continue to disperse the impact load laterally rather than downward. This provides superior impact and pressure relief than any other medium! Check out this video! Do you think you can do this with a gel pad or air pad? Why do I still see sweat marks? All horses sweat when they run. The EquiPedic™ pad with the EquiKOOL™ Temperature Management System does not stop your horse from sweating. It moderates and manages the surface body temperature of your horse. By keeping the surface body temperature closer to the horse’s normal temperature, it helps the horse to feel more comfortable and cooler. It helps the horse to sweat less over extended periods of time, but it does not completely eliminate the sweat. Why does your pad look thicker than others? Looks can be deceiving. The EquiPedic™ pad uses either 3/4" or 1" of ConforPedic Impaction Reduction Material™ for our inserts, dependant on the pad. The pad itself is only 3/8" thick. However, with a saddle and rider in place, the pad and the inserts are designed to compress down in size, though never less than 3/4" in thickness underneath the saddle bars. The pad is actually a close contact pad. Where your legs make contact with your horse, you only have 3/8" of material. Why don't you have a cutback? The EquiPedic™ pad with EquiKOOL™ and EquiCharge™ was designed to fit a variety of horses. Some horses have flat withers while others have withers that resemble ski slopes. The four inch rise of the contour at the front of our pads and the one inch rise of the contour at the rear of our pads will accommodate both of these horses as well as any in between, including swaybacks. Our EquiGrip Strips™ made from ToughTek® ensure that the pad will not slip and will stay in place on any shape horse. Also, this design allows greater freedom of movement for the shoulders of the horse and allows them to perform better. The front ends of our pad will not slide down like cutback pads. The EquiGrip Strips™ and the EquiGrip Mesh Back™ are made from a material specifically designed to prevent slipping in wet conditions. Our EquiGrip Strips™ and the EquiGrip Mesh Back™ lock the top of pad to the bottom of the bars of the saddle, preventing the pad from moving in relationship to the saddle. The pad won’t slide from front to back either. How do you wash the EquiPedic™ saddle pad? If pad is wet from sweat, allow pad and inserts to air dry before attempting removal of inserts. Remove the ConforPedic™ impact reduction material inserts by curling into a "U" shape. Drop the pad in your home washing machine. Wash with cold water on knit/delicate gentle cycle for no more than 6-10 minutes. DO NOT PRESOAK. Hand wash if you do not have this cycle. Use a liquid detergent like EQ Solutions Soil Release or Woolite. Air dry or tumble dry at lowest setting. Remove inserts from the pad. Soak or rinse in plain water or a baking soda and water solution to remove odors. Place inserts on a towel and press down to remove excess water. Do not twist or roll inserts when they are wet! Do not hang over a line to dry. Allow to air dry on towel. All returns and exchanges require a Return Material Authorization number. No returns will be accepted without an RMA number. This number can be obtained by calling 575-585-3636 or by email. 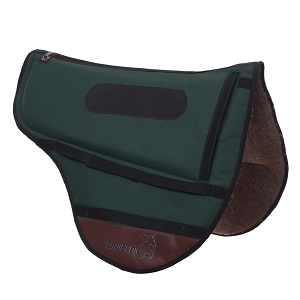 All saddle pads are provided with a 30 day money back guarantee from date of purchase exclusive of shipping costs. All returns are subject to a restocking/cleaning fee not to exceed 15% of original purchase price. Any returns after 30 days will be prorated. No returns will be accepted after ninety (90) days from date of purchase. Cinches and girths are provided with a 15 day money back guarantee from date of purchase exclusive of shipping costs. Any returns after 15 days will be prorated. No returns of cinches and girths will be accepted after 30 days. Human Wear is provided with a 15 day money back guarantee exclusive of shipping provided packaging has not been opened. Human Wear will not be accepted for return if the packaging has been opened due to health law requirements.